They say people have short attention spans these days, but if there’s one thing humans can do for long periods of time without flinching or the mere thought of giving up, it’s be petty as hell. Take, for instance, this recent battle over a Los Angeles parking spot that lasted more than an hour and a half. The whole situation was documented in a Twitter thread by user Mariah Flores on April 1, but doesn’t appear to be some kind of bad joke that inconveniences a bunch of unsuspecting people—it seems, truly, to be a battle of wills that could have gone on forever, but shouldn’t have gone on for more than two minutes. It all happened in the Koreatown neighborhood in LA, when two drivers going for the same spot of street parking at around 6:20 p.m. local time ended up in about the least action-packed fight the world has ever seen. 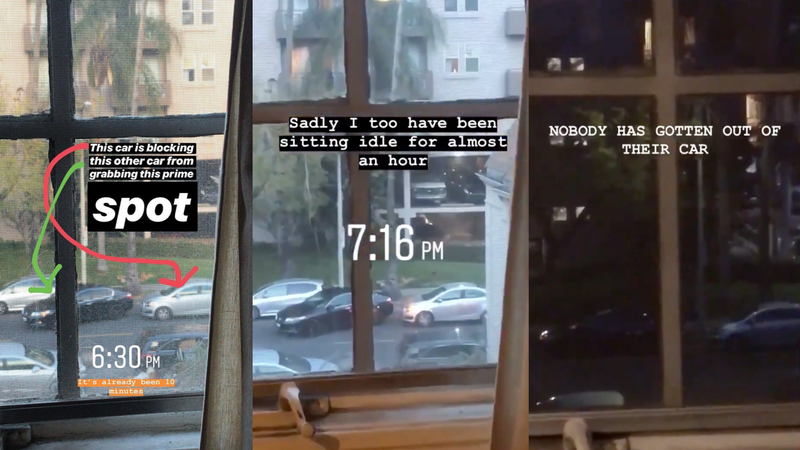 Once the two cars wedged themselves into a feud over the spot, they just sat there, and sat there, and sat there, for what CBS Los Angeles to have been an hour and 40 minutes. The whole Twitter thread—videos, timestamps, commentary, polls to vote on which driver would win and all—can be clicked on below. Another driver finally freed up a spot right next to the open space the two cars were going for, but that didn’t end the fight, according to the Twitter thread and the CBS Los Angeles story. The drivers then sat in their respective cars, likely not wanting to be the first to get out after their nearly two-hour battle that was apparently important enough to block traffic for. CBS Los Angeles reports that the area the cars were in is known for its restricted street parking, but here’s the real kicker: It wasn’t just about getting a coveted spot, since Flores and the driver who freed up a space, Andrew McCray, told CBS Los Angeles that there were other parking places open down the street. That, everyone, is a level of pettiness we should all hope to never reach.